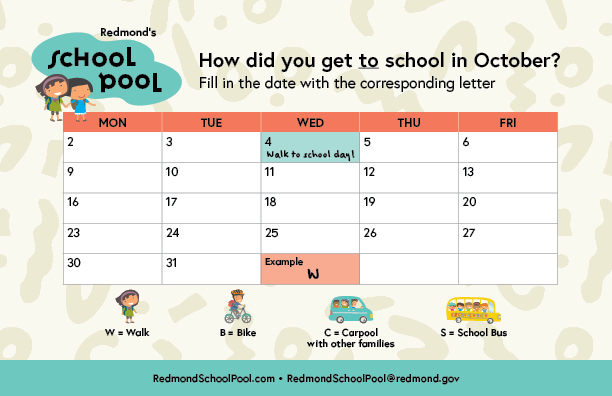 October is almost here and it's the City of Redmond's SchoolPool Month. The SchoolPool program encourages students and their families to leave the car behind when traveling to their neighborhood school to reduce neighborhood traffic congestion and local air pollution. Your student will receive a SchoolPool calendar to fill out and each returned calendar earns RMS PTSA up to $3,000 per school year and students can earn rewards, like a free Redbox rental, at the end of the challenge! This October, make it a priority to help the school, the environment and ultimately, the students! More info to come soon! Questions? Contact schoolpool@rmsptsa.org. Don't Forget To Pack Right!
" Say can't without the "T" and successful you will be "